deal just fall through. No HOA fees or restrictions, NO lead-based paint disclosure. very nice and clean single family house(not manufactured house) inside & outside, close to downtown plant city, covered and screened porch, large fenced back yard, 3 bedroom, 1 bath single family house in a desirable area, conveniently located just minutes from I-4 in Plant City of Hillsborough County. a couple of minutes to downtown plant city, convenient to highways, hospital, shopping and restaurants, There is lots of potential and with a little work(lay carpet) this will be a really cute starter home or rental. kitchen has wood cabinets, sink, faucet and tile back splash, very clean refrigerator and smooth surface range, bathroom has tub, toilet, vanity and plumbing, the only thing needed in the house is carpet to make it a income rental property or starter house. 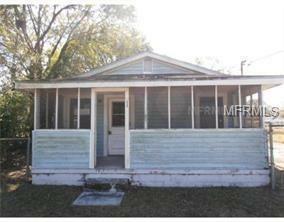 compare to similar houses in plant city listed in the market, this property really has great price. Make an offer today. you can never find another "as is" house like this condition and at this price in Hillsborough county. Come to see today, Hurry before it's gone. You don't want to miss this one, can close ASAP.